The APNU+AFC administration has clarified that thirty-three persons appointed as Honorary Ministerial Advisors are working for free and without diplomatic passports. This was confirmed by Minister of State Joseph Harmon who was responding to questions raised in the National Assembly by Opposition members of Parliament. 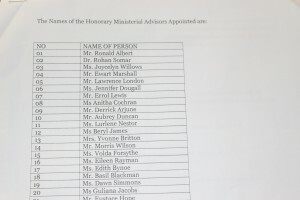 The names of the 33 members appointed are as follows: Ronald Albert, Rohan Somar, Joycelyn Williams, Ewart Marshall, Lawrence ‘Larry’ London, Jennifer Dougall, Errol Lewis, Anitha Cochran, Derrick Arjune, Aubrey Duncan, Lurlene Nestor, Beryl James, Yvonne Britton, Morris Wilson, Volda Forsythe, Eileen Rayman, Edith Bynoe, Basil Blackman, Dawn Simmons, Guliana Jacobs, Eustace Hope, Gordon Winter, Artie Ricknauth, Jerome Bulkan, Hazel Binger, Donna Lindon, Desiree Horne, Ovid Morrison, Veronica Munroe, Wayne Forde, Savitri Farley, Tamesh Lilmohan and George Williams. He made it clear that formal or academic qualifications were not a prerequisite for in making such appointments. The Minister said that the persons were appointed to establish relations between individuals, organisations and businesses in the diaspora. They are tasked with encouraging those persons to return to Guyana and contribute to the country’s development. There were other Ministerial Advisor appointments to several other Ministries. These have been identified as Cheryl Sampson, and Allan Munroe – Advisors to the Ministry of Education. Ndibi Schweirs, advisor to the Ministry of Natural Resources. 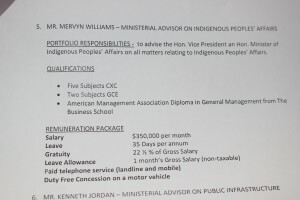 Lance Carberry, Ministerial Advisor on Constitutional Reform to the Minister of State, Mervin Williams – A dvisor to the Ministry of Indigenous Affairs and Kenneth Jordan Ministerial Advisor on Public Infrastructure. Notable in the mix, Williams earns as salary of $350,000 per month with other benefits. Williams, has five CXC subjects with two GCE subjects listed among his qualifications. He also has an American Management Association Diploma in General Management from the Business School in Georgetown. Carberry takes home a gross salary of $250,000 with additional benefits. He is charged with advising the Minister of State on all matters relating to proposals for constitutional reform. His position is juxtaposed with that of the Steering Committee on constitutional Reform and the Office of the Prime Minister which has responsibility for constitutional reform. Moreover, Carberry has no background in law but rather a Degree in Economic and a Master of Science Degree in Management and Administrative Science both from London based institutions. London, at the Ministry of Public Infrastructure, has a salary of $600,000 per month along with additional benefits. He is directly responsible for advising the Minister of Public Infrastructure on all matters relating to the financial administration of the Ministry especially in relation to International Funding for Public Infrastructure.